Kunthi Bali Spa has calm atmosphere because it is built at the back of the by-pass. The spa offers long-time treatment packages as reasonable price and the villa package which you can spend leisurely time in the private villa. 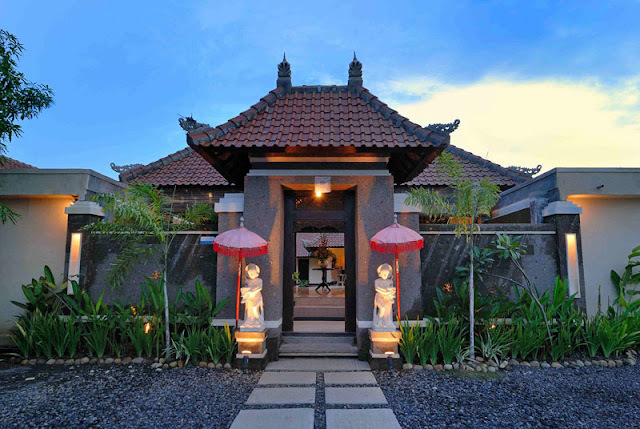 Kunthi Bali Spa with the 20 beds, foot massage room, saloon , locker room, and nice garden to make refresh your mind. There are also 2 single-rooms, so it is recommended for not only couples but also single guests who want to enjoy spa by themselves. This massage uses the combination of honey and aromatherapy essential oil to discharges the excess salf from the body, to help promote cell regeneration and growth and increase metabolism. It is performed by using honey starting from honey bath, cream bath and facial to the end. You can enjoy a moment of luxury using 100% Balinese pure natural honey that excellent ingredients for the beauty including vitamins, minerals, amino acids, enzymes and other essential nutrients. Lymphatic massage performed by using the famous traditional Balinese essential oil "BOKASHI". This massage can help you romove body wastes and relieve stiffness and fatigue. Traditional Balinese herbs can warm your body, encouraging your body to remove toxins and discharge body wastes. This package is very effective for fatique relief. Kunthi Bali Spa's most popular spa menu. The warm oil is massaged into the body ot penetrate into the skin. Then, the massage performed by using heated stone or herbal ball. It is effective to remove toxins and body waste. Shirodara is called the massage of the brain. This therapy is very effective to deeply relax your mind. Facial, Creambath and total care. It is an untimate healing to escape the daily physical and mental stresses of everyday life. This package treatment has a slimming effect. It also relaxes and refreshes your body and mind. A strong pressure massage uses slimming oil, concertrating on waist, hip line and legs that is excellent for romoving stored impurities from body. It involves a special care combining Indonesian's ancient natural herb remedy including Balinese Boreh mask and herbal bath will help you romove toxins and body waste. Meal & Drink & Gift. Calp treatment and hair therapy with a fresh blend of coconut milk and avocado cream. This treatment will help clear your mind and encourage hair growth. It helps to regenerate skin cell, facial massage gives a relaxation and lifting effects on your face skin. The treatment will leave your skin clean and glowing. Cleansing massage, scrub, cream massage, pack and cold press. This massage performed by using heated stone. The energy from natural stone will help you to decrease muscle tension, warm the body, ease muscle stiffness and improve blood circulation. Kunthi Bali natural scrub can help to remove skin waste materials with no side effect, the body mask can help to nourish your skin, refreshing sensation on whole body skin. Shirodhara is representative technique of the Ayurveda. This treatment begins with massage from head, shoulders, hands and feet and then the warm oil is poured onto the center of forehead known as the "third eye". It is effective to calm the mind and relieve mental tention. To restore optional body function and promote body balance, at the time to relieve foot and whole body fatigue. Treatment massage uses soft pressure massage techique using natural aromatherapy oil. It is effective to heal both body and mind. Traditional Balinese Massage using medium pressure massage. It is effective to improve blood flow, re-energize your body and relax tired mind.